It has been 10 days since the finance minister Piyush Goyal presented the interim budget. And I am still writing about it. It will soon become clear why. In his speech Goyal said: "Our Defence Budget will be crossing Rs 3,00,000 crore for the first time in 2019-20." Like almost everything else in the budget this sentence was also designed for claps and a full marketing impact, which it clearly got. What the minister forgot to tell the nation that there is something called inflation or the rate of price rise. And given that, the defence budget would have crossed Rs 3 lakh crore at some point of time and it will do so in the next financial year. The defence budget for 2019-2020, the next financial year, is budgeted to go up by 7% to Rs 3,05,296 crore. The interesting thing is that the increase in overall expenditure between 2018-2019 and 2019-2020 is budgeted to be at 13.3%. Hence, the growth in the defence budget has been at a much slower pace in comparison to the overall expenditure. It would be interesting to know what explanation Goyal has for this. The important thing is to look at what portion of the overall defence expenditure has been allocated towards capital expenditure, over the years. Let's look at Table 1. What does Table 1 tell us? In an answer to a recent question raised in the Lok Sabha, from which the above table is sourced, the government said: "Capital Expenditure in absolute terms has gone up by Rs 19,342.42 Crore (24.11%) during this period." What the government did not tell us is that the overall defence expenditure during the same period has gone up by 41.6%. Hence, clearly the capital expenditure has grown at a much slower pace. This also becomes clear from the fact that in 2013-2014, capital expenditure formed 38.43% of the budget. This was down to 33.69% in 2018-2019. Clearly, more and more of the defence budget is getting used up in meeting the regular expenditure, from salaries to pensions. In 2019-2020, around 34.2% of the defence budget has been allocated towards capital expenditure and is a slight improvement over the previous years. Now, why is capital expenditure in the defence budget so important. If you are the kind who follows news closely, you would remember something a senior army general told a Parliamentary Panel in March 2018. Vice Chief of Army Lt Gen Sarath Chand, did some straight talking and said, "a whopping 68 per cent of the equipment of the army is in the vintage category while just about 24 per cent is in the current state, and eight per cent in the state of the art category." What this tells us is that the defence preparedness of our army is really not up to the mark. It needs newer equipment and weapons, for that it needs money and for that to happen the government needs to increase the capital expenditure in the defence budget. And for that to happen, it needs to increase the overall defence budget, because regular expenditure of any kind cannot be slashed and needs to be met. The Hindu has an excellent piece on this issue. The projected capital expenditure of the army is Rs 36,000 crore; the budget allocation is Rs 29,700 crore. The projected capital expenditure of the navy is Rs 35,714 crore; the budget allocation is Rs 22,227 crore. 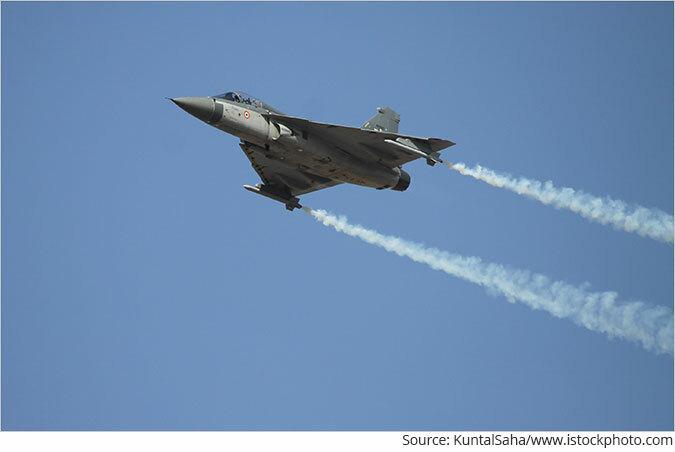 The projected capital expenditure of the airforce is Rs 74,895 crore; the budget allocation is Rs 39,347 crore. As the newsreport in The Hindu points out: "the Indian Air Force (IAF), which has signed major deals in the last two years, including for the 36 Rafale jets and S-400 air defence systems, and is beginning to induct platforms like CH-47F Chinook heavy lift helicopters and AH-64 Apache attack helicopters, has committed liabilities of Rs 47,400 crore." Where is this money going to come from?" I am no defence expert, but it is clear to me that our defence forces need more money than is being allocated to them. This, of course, is in contrast with the jingoism of the leaders of the governing Bhartiya Janata Party, who do not fail to talk about Uri, the recent smash Hindi film hit which has now done a business of more than Rs 200 crore, given half an opportunity. The question is why is this happening? The answer is India's Big Government. The Indian government over the years has tried to do way too many things and made a mess of most. As Kaushik Basu writes in An Economist in the Real World: "One mistake early Indian policymakers made was to try to micromanage the economy. While it is true that the government needs to attend to a range of policies, from shipping to the quality of education in villages, to managing the nation's international economic relations, it is imperative to realise that it is not feasible for the government to attend to all the varied and layered needs of society with equal diligence." How does this apply in this case? Clearly, the government is involved in too many things and hence, doesn't have enough money to spend on the India's defence preparedness. While, statements of the government may suggest so; the allocations of money clearly suggest otherwise. And l like to basically follow the money because that tells us clearly whether they really mean what they say. In this case they don't. Between April 2017 and March 2019, the government would have ended up spending more than Rs 2,00,000 crore to recapitalize and rescue public sector banks, which it basically owns, and which are in a mess because of bad loans. Of course, this has been financed through raising the taxes collected on petrol and diesel, but clearly that hasn't been enough, and it has had an impact on the capital expenditure in defence as well. As I keep saying, there is no free lunch in economics. And this is another excellent example of that. The cost of the socialism of the government continuing to own 21 public sector banks, is shaky defence preparedness. We request your view! Post a comment on "The Big Hole in the Defence Budget of Piyush Goyal". Thank you for posting your view! 4 Responses to "The Big Hole in the Defence Budget of Piyush Goyal"
Every ministry asking for more money and no one getting that much ever. Our priority should be food and shelter, as we are not in the state of war. So, the argument. you and The Hindu, placed are not much valid. Hello, My comment is with reference to capital expenditure towards procurement of new planes, helicopters etc. Are those expenditure amounts mentioned in the article for year 2019-2020 or are those expenditures spread over couple of years? Agree with you that the defence budget is high due to jingoism. Declaring that we will fight a two front war is jingoism. It is also a failure of our diplomacy. What would Chanakya have said ? Make at least a modus vivendi with at least one neighbour. When that is done, we can reduce the defence budget. Major capital expenditure of defence budget has a minimum time lag of 3-5 years. Thus capital orders placed prior 2014 are now being paid. Thus proper statement should have been yearwise orders placed and corresponding year wise spent and balance amount. This would have given a correct picture of Defence capital expenditure performance.